Many people find it difficult to attain a balance between living by meditation and Grace and living effectively in the world, feeling that they have to choose between them. Our Spiritual Resources makes it clear that we do not have to retire from the world, for our daily responsibilities themselves can spur us on to spiritual unfoldment. In fact, says Goldsmith, meeting everyday problems and responsibilities through the practice of spiritual principles is a more effective way of attaining a realized consciousness of oneness than withdrawing from the world. Problems and situations become opportunities for us to practice applying spiritual principles and to access our spiritual resources. 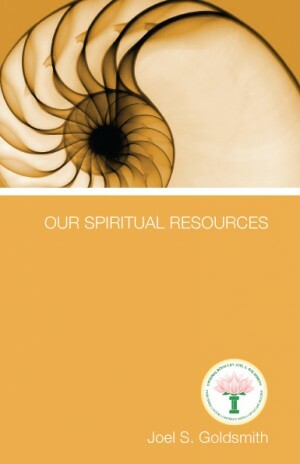 Our Spiritual Resources is a light-filled guide to the treasure of spiritual resources available to us and a guide to accessing them through praying correctly, understanding the true nature of mind and body, living by meditation, bringing God into daily experience, and much more. 11. What Have You in the House?